I remember reading this book when it came out. I was fresh from the army, maybe for six months, and attending Camden County College on my Army College Fund. Every day of class I took a TNJ bus to campus. 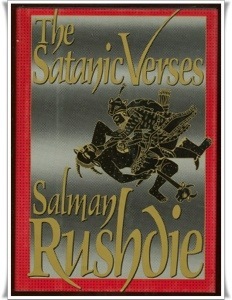 One day I was on the bus, reading The Satanic Verses, when a young guy like me got on the bus headed to CCC. He kept staring at me, and finally I asked him if he knew me from somewhere. That book, he said. How can you read it? A conversation ensued about Rushdie’s book between the bus driver, the other guy, and me. The bus driver was African-American and a Muslim. It turned that the guy who asked me about The Satanic Verses, also a Muslim, came all the way from Iran with his family to settle in America. At one point, the bus driver asked the young Iranian: You would kill Rushdie if you met him? Yes, the other guy replied. It is my duty. Rushdie offends Islam. But I am a Muslim, the bus driver replied. I don’t want to kill him. You don’t even know him. You’d throw away your entire life over a book? The young Iranian kept his position. The next day he wasn’t on the bus and the day after that he didn’t show up either. I would see him on campus from time to time, but he never acknowledged me. And yes I read the bulk of Rushdie’s book on that bus. I don’t know if the bus driver ever got around to it.